Learn to Play Dio, Multimedia/Video Pedagogical Aid from Lick Library. 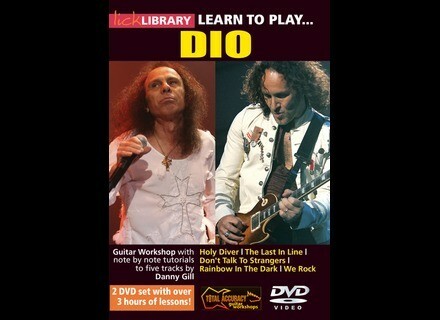 Lick Library bring you Learn to Play Dio, a guitar tuition DVD for five metal tracks of the 1980's, written and sung by Ronnie James Dio. This double DVD set has about three hours of guitar lessons with Danny Gill taking you through the fast high energy playing of Vivienne Campbell on these classic Dio tracks. Danny uses the music to get you into scales, takes you through the solos note for note, and then performs the songs to a backing track so you can see how they all fit together. And all the time the DVD guitar lesson shows by split screens what both of Danny's hands are doing. 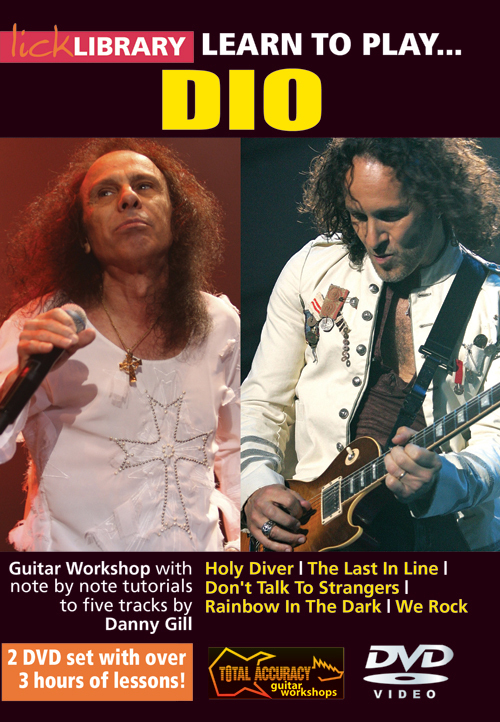 Learn To Play Dio (RRP £24.99) - Included on this guitar tuition DVD are guitar riffs and solos - the tracks featured are Holy Diver, Don't Talk To Strangers, and Rainbow In The Dark from the Holy Diver Album. Then Danny takes a look at The Last In Line and We Rock from Dio's second studio album The Last In Line. For further information about Lick Library and its products go to www.LickLibrary.com. Avid M-Audio Pro Tools SE For Pro Tools users with an interest in musical composition, editing and production, the new Avid Recording Studio, Avid KeyStudio and Avid Vocal Studio systems provide Pro Tools SE software and M-Audio hardware. Avid Digidesign C|24 The new 24-channel C|24 control surface is designed to provide direct control of Pro Tools mixing, recording, and editing, an array of analog inputs, and a 5.1 analog monitor section to use with your Pro Tools I/O. Avid M-Audio Oxygen 88 Designed for use in the studio or on stage, the new M-Audio Oxygen 88 USB MIDI controller keyboard is designed to satisfy players who need the feel of a piano combined with the power of a modern MIDI controller.